The Bobcat Chronicle: More Awards! 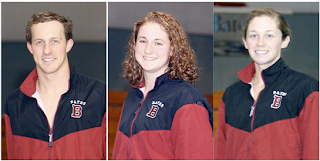 The Winter NESCAC ALL-ACADEMIC team was announced yesterday with Jake MacNaughton, Sarah Reingold, and Katelyn Drake all bringing home honors! The award goes to NESCAC Varsity athletes who have lettered at least 3 years in a varsity sport, and achieved a cumulative GPA of 3.35 or better. Not a bad group of Captains, huh?! Congrats! It's a great day to be a Bobcat!